By dedicating the 3rd staging of her Accra Community Tour Concert, it is to be widely noted that the reggae songstress Queen Ruki has more to offer Ghana than just music, her express demonstration of social responsibility, health consciousness and serious concern for community cleanliness on the 31st of March in Nima is a prove she has plans to compliment the government's efforts to instill good sanitation practices across the nation. 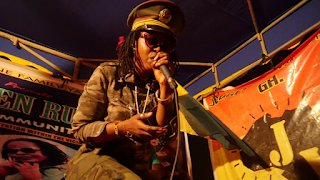 Prior to this Nima tour stop, Ruki had already staged the 1st and 2nd tour stops off her Accra Community Tour itinerary in Lapaz and New Town respectively and both were just music, but she made a laudable difference with her 3rd staging by organizing a massive clean-up exercise in the streets of Nima in the morning of the event date with fans and some of the supporting artistes on her concert bill. Mid way artiste performance on the night of the concert, Jah Gold, Jah Wiseman and Black Santino took turns on the stage to offer health and sanitation speech to conscientise the Nima community on the importance of cleanliness. The 3 advised the Nima people keep periodic clean-up routines to help the community ward off the outbreak of diseases and infections. And many other artistes from the Nima Judgement Yard. Kojo Kombolo was the special guest artiste.